Nicki Minaj, a rapper known for exhibiting explicitly sexual content in her songs and stage performances, thanked her pastor on Sunday after receiving the award for best hip-hop video at the MTV Video Music Awards in Los Angeles, California. The songstress snagged the win for her "Anaconda" video which set YouTube records during its release last year. "This is so random, you know who I want to thank tonight? My pastor," said Minaj. "Thank you, Pastor Lydia. I love you so much." "Anaconda" features sexually explicit lyrics and the music video shows scantily clad women twerking and dancing. Minaj sampled the 1990s smash "Baby Got Back" for the song. Shortly after thanking her spiritual advisor, Minaj attacked the VMA's host, Miley Cyrus, for her recent comments in the media regarding a rant made by Minaj on social media addressing the lack of nominations for "full-figured" women at the award show. The rapper held nothing back while addressing the former "Hannah Montana" star. "And now, back to this [expletive] that had a lot to say about me the other day in the press. Miley what's good?" asked Minaj. Miley responded by chalking up her negative comments about Minaj to media spin. "Hey, we're all in this industry, we all do interviews and we all know how they manipulate [expletive]. Nicki, congratulations," said Cyrus. The camera showed an infuriated Minaj after Cyrus finished addressing her. Many fans are claiming their exchange was staged. 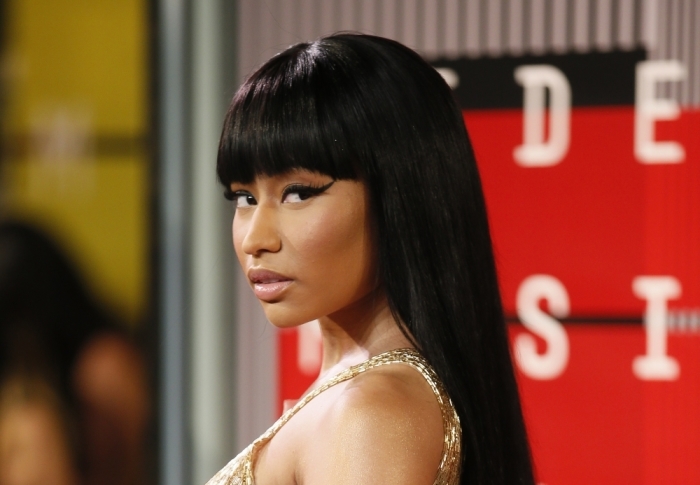 An insider from Minaj's camp, however, said her rant was far from an act. "Nicki was livid with Miley and decided to air her feelings onstage," said the insider to Us magazine. "The anger was very real and not a pre-planned bit at all." The source also told the publication that MTV staffers made sure that the two did not cross paths for the rest of the night in order to avoid legal issues. Cyrus spoke out against Minaj in The New York Times last week for complaining that she was only nominated for 2 VMAs for "Anaconda" and attributed it to the fact that she wasn't white, blonde and skinny. Taylor Swift responded to the tweet thinking it was a shot at her, but Minaj clarified her comments. "I saw that. I didn't really get into it. I know there was some beef," said Cyrus to the Times. "I don't really know. There's a way to talk to people. … What I read sounded very Nicki Minaj, which is you know Nicki Minaj is not too kind. It's not very polite. I think there's a way you speak to people with openness and love."